I hope everyone’s week has been going well, we’re almost to the weekend! 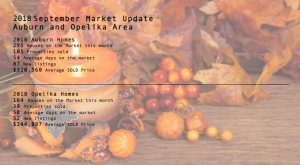 Let’s talk about the housing market and compare it from last year to this year within the Auburn and Opelika area. I’ve said it before and I’ll say it again, buying or selling a home is difficult. We’ve all been there; we’ve been through the frustration of either having a house that just isn’t selling or not finding the “right” house for you. There are just so many variables that go into it, but the biggest one in my opinion would be making sure that the market in your area or the surrounding areas is right. The saying goes “strike the iron while it’s hot” and this saying goes with pretty much anything, especially real estate. 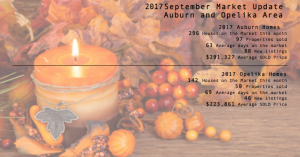 The Crawford-Willis Group has been comparing both the Auburn and Opelika markets from both 2017 and 2018 and we’re noticing one trend, increases. When you look at both of the locations, we can see that people are in a buying mood based on the increased numbers of ‘properties sold’ this past year as well as a decrease in the number of days that those houses have been on the market. When talking to the guys about what season is best for buying they’ve said that because we live in a college town that the seasons are more like semesters around here, which makes sense because of the university. That being said, land is a limited resource and that makes it a hot commodity among this college based town and the best time to buy or sell that commodity is now. People are snatching up these properties left and right so you’re going to want to get in on the action sooner or later, probably sooner rather then later in this case. Tell me if this sounds familiar to you, you’re a college student finishing up your first year at whatever college you decided to go to (War Eagle). You decide that you want to mov e apartments and think you’ve got plenty of time to find a new one before the end of the semester. You’re not too worried, you’ve talked to some friends and even they haven’t started looking. Fast forward through classes, midterms, finals, life, and other obstacles that your typical college students face; now there are no more apartments or houses left, just subleases. And they’re only lasting 3 months. You’re frantic and end up settling on a sublease that’s not exactly what you had in mind…if only you had looked more thoroughly into a living situation for next year, lesson learned. I’m speaking from experience here everyone, don’t learn this lesson the hard way, learn it the easy way and contact Crawford-Willis Group for all your living situation needs! Remember, the irons hot right now.